My daughter runs a very busy household. She is the cook, bottle washer, laundress, shopper, meal planner, taxi driver (to 2 busy kids), and she homeschools her fifth grade son. 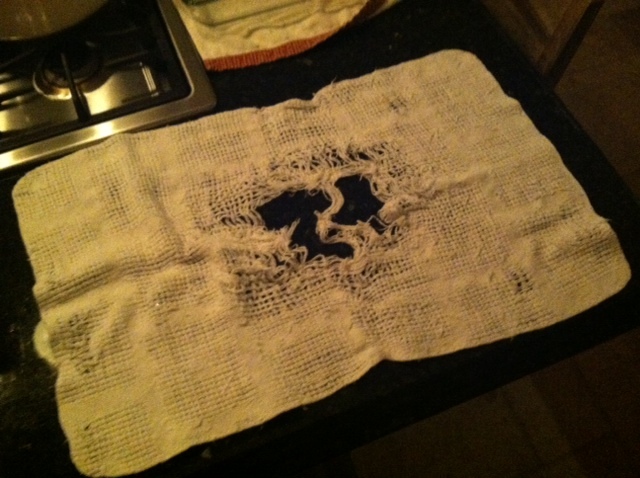 There are days she feels just like this holey dish towel. She is definitely wholly into her life – she works hard and puts her whole self into her whole day. At eight o’clock in the evening, she turns off the kitchen light, sets the timer on the dishwasher and goes upstairs to her quiet and peaceful oasis behind the bedroom door. If she is lucky there are no knocks on the door for a little more help with homework or someone looking for some misplaced item. My daughter’s life is holey, wholly, and holy – she is a vessel of holiness. Sure, a cracked pot, just like the rest of us. A sinner saved by grace? You bet. Does she depend on God’s holiness much? Understatement. Have a wholly blessed and holy Thanksgiving. I loved this. It speaks so fondly of all those Mothers out there that are doing what she does. The highest job with the least amount of pay and recognition. But, with the most blessings and rewards in the end. You have to be all three, holey, wholly, and holy. Carol, you are absolutely right! Thank you, Susan…..I love this! And your description of Marni is so apt. Love y’all and happy Thanksgiving! Kath’ I am so glad you got to meet my hero, my girl, Marni! Indeed : ) Happy Blessed Thanksgiving to all! Marn is in the battle. Her arms are weak from work, her back hurts from bending low to the needs of her extended family. Her head may hurt from all the thoughts of “must get that done, do this…..” Her body probably cries out for relief of the physical and emotional kind, no doubt. But she is also blessed. She is in the midst of God’s call, at least for this season, on her life. To raise, nurture, sustain, lift up her household and clean the kitchen counter top one more time. I, for one, envy her. One of the greatest gift is to be a Mom. They may not realize it now, but they are such a Blessing to their children. In years to come, they shall see. How sometimes, I wish, that I could go back and start again, praying blessings over my children. Yes Susan, I too have been holey, wholly and now trying to walk with the Lord to be holy with and for Him. The Lord has also done great things for us this year and in the past and for this we too are thankful and filled with joy. So much to be thankful for – this vessel of holiness. I can relate to your mother’s heart rejoicing in wholeness. I’m flattered, honored and grateful I am the talking point memo for this Wednesday’s blog. I’m so thankful today and everyday to have been given a mom that is so incredibly faithful, truthful, available, creative and giving. A graceful mom is probably the next best thing after of course, the Grace Giver Himself. Happy thanksgiving! And thank you for all of the lovely comments from your readers.